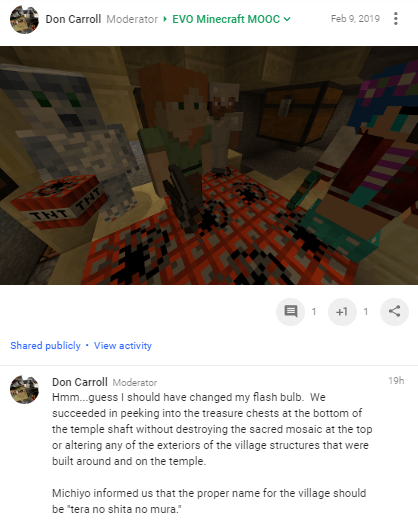 On Feb 8, 2019 the EVO Minecraft MOOC temple busting team of Abu Fletcher, Dakotah Redstone, Jane Chien, Mattie Tsai, Michiyo, and Teacher Vance applied logic and geometry (or at least Dak did) to the puzzle of getting into a desert temple by excavating around the side of it and under it, exposing and rendering harmless the TNT that booby-traps the bottom of every unexplored temple, and helping ourselves to what was in the zombie chests. So when Michiyo appeared next day, apparently Abufletcher, Michiyo’s teacher in Japan, encouraged her to visit the new temple, which is where I met the group when I arrived, having just emerged from a cab at my apartment which had brought me from the bus station in Penang where I had just left a bus that had left Kuala Lumpur 6 hours earlier. 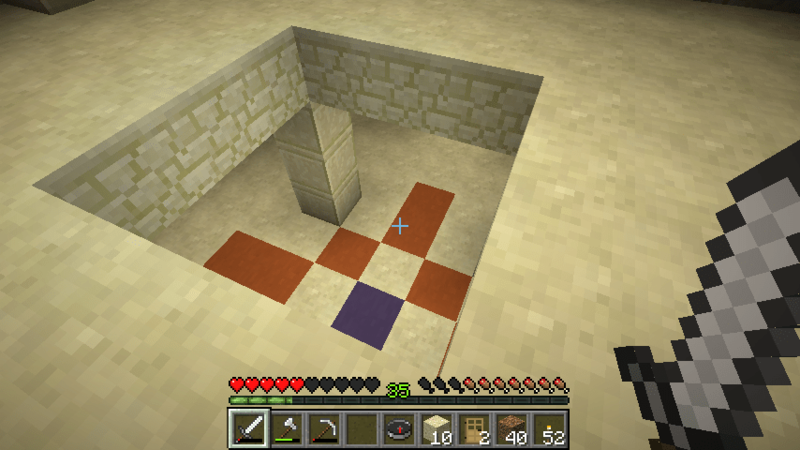 I joined Michiyo, Abu Fletcher, Dak, Jane, and Mattie in Minecraft just as they were all about to head down the polished stone road that Dak had created leading over to the Temple Under Town that Abu Fletcher had found the previous day, where we would see if we could unlock its secrets in a systematic manner. The event was on the 2019 EVO Minecraft MOOC Live Events schedule, which is linked from the sidebar at the #evomc19 landing page at http://missions4evomc.pbworks.com/. That link should be working far into the foreseeable future. 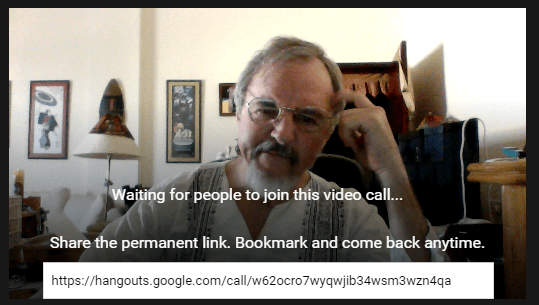 which I reconstruct here since these links to Google+ will no longer work after March. A most unusual temple!!! Come and help us explore (but not pillage) both the temple and the village on top of it! Dak is busy building a protective wall around the village (immigrants welcome). Great find 🙂 Sorry I couldn’t join. I was fighting with command blocks and was reading and watching things online trying to get them to work as I wanted. In another post I invited participants to come help us “loot” this temple but I withdraw that poorly worded invitation and leave the disposal of this one to my esteemed colleague and co-moderator, Abu Fletcher. If interested in looting a temple I can invite you to another one, if it hasn’t been looted already (I wouldn’t know for sure until I went there and tried to loot it). Sign up for the expedition in the reply area below. 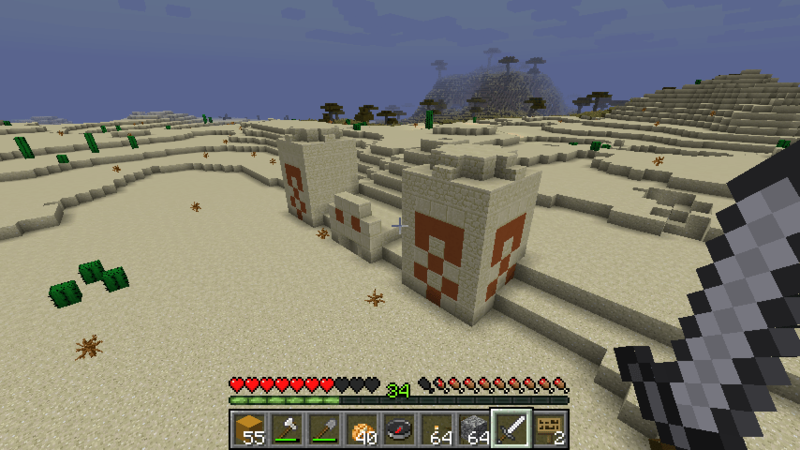 I’m more interested in how the temple and several village structures seem to have become intertwined. I’d like to see if we can untangle the parts before damaging anything with a “smash and grab” approach. Honestly, after looting a few temples, it all gets to be pretty routine. Often I don’t even bother. I’ll be in-game at about 14:00 UTC. +Don Carroll Yes, exactly, by “looting” a temple I mean to approach what lays beneath the blue and red tiles in a calm and systematic manner, avoid setting off the TNT, which we know is down there. By working systematically and on arriving safely in the space below, I suggest that we open the lids on the chests that will also be there and peek inside. I think this is one of those constructive activities that show Minecraft in its most collaborative mode, and reveal to participants how critical language is in the process (for example when Abu Fletcher told me once, in text, DON’T STEP THERE. Step is probably a useful word in English, as is its appearance in a negative imperative.) But more importantly, the instructions to one another as we work toward a common goal are the point of the exercise. Hope to see you at 1400 UTC if the bus I’m on reaches Penang in time. If anyone would like to join us in the exploration of this temple and / or others, please click REPLY below. 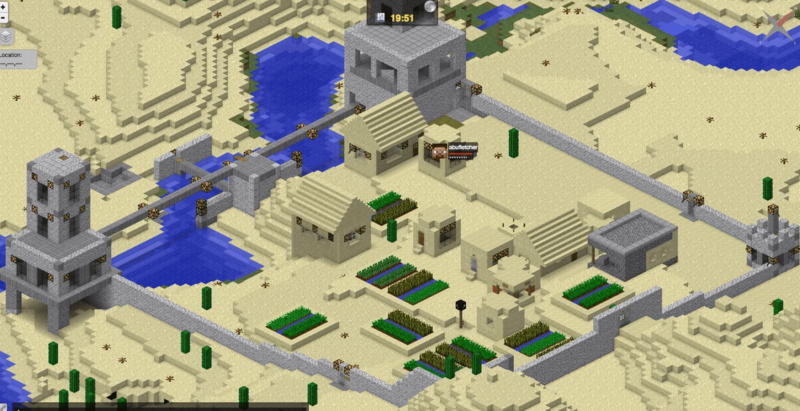 Here’s an aerial view of the temple/village (from the dynamic map). Actually, Vance I would suggest that we entirely leave the “loot” alone. It’s really not interesting. Instead, I’d like to see us work creatively and in unison to “map out” how the temple and village structures are intertwined. For example, can we find minimally invasive ways to get into the main temple structure WITHOUT damaging ANY of the exteriors of any of the village structures? 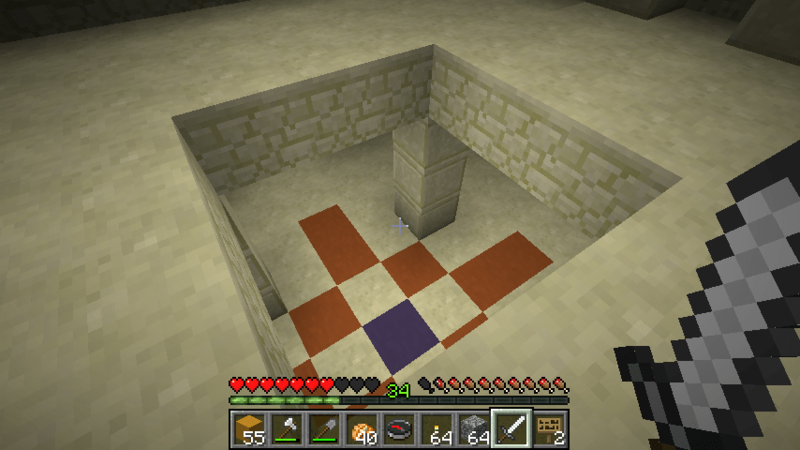 In fact, anyone who just wants the loot is welcome to get it through a diagonal tunnel (as I have done before on many temples). +Don Carroll I liked +Dakotah Redstone’s spiral approach, as evident in the video. On Tuesday, February 5 in Europe and points east of there, but still February 4 in the USA, Kim Harrison a.k.a. K4sons invited EVO (Electronic Village Online) Minecraft MOOC participants to visit VSTE’s Minecraft Monday, a regular monthly event hosted by the Virginia Society for Technology in Education. Dakotah_Redstone and Beth O’Connell helped plan it with her. The VSTE events are held on the first Monday of each month from 8 to 9 PM EST (New York time). Today they were visiting East Coast Miners, a building guild for under-16s patterned on the work of Jo Kay’s Jokaydia, http://www.jokaydia.com/. East Coast Miners provided a tour of what that the teachers are doing with kids after hours. After settling into the environment, we started recording at a turtle farm where one of the kids was raising turtles. The new release of Minecraft 1.13.2 contains an underwater environment that spawns corals and a variety of sea creatures, so after swimming with the turtles, we moved to a coral reef where we swam with dolphins and other creatures, and visited an underwater shipwreck. There DarkKnight tossed some treasure maps into the water and you can see on the video where your map shows your location and allows you to use your F3 coordinates to navigate to X-marks-the-spot, where there was buried treasure. We all went there and eventually uncovered a treasure chest full of goodies. We then lapsed into a reflection of how this might work for learners of a variety of topics, including learning languages. Jane in Taipei related how her son Mattie was interacting with the East Coast Miners and developing his English and problem solving skills. Thank you, +Kim Harrison for inviting us on the East Coast Miners server. Treasure hunting was a lot of fun! The coral reef and tropical fish are so beautiful! I think that kids can learn far more by collaborating and communicating with players in Minecraft than they can by taking online synchronous language lessons (Online language tutoring/learning has been a trend lately). I see a lot of creativity, problem-solving, and peer-teaching with patience in Minecraft. I was taught by Cats, a teenage east coast miner, how to fly. She gave me lots of tips and feedback to my repeated failing attempts, and with her help, I re-learned how to fly in survival mode in Minecraft! The East Coast Miners Minecraft Community is operated by two educators and one geek (engineer) in the hopes to enrich STEAM skills science, technology, engineering, art and math as well as communication and collaboration skills. How to join the VSTE server? 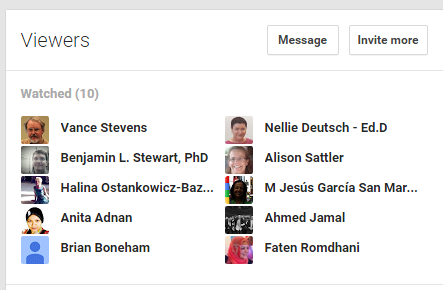 We’ll all be sad to see this and so many other fruitful communities disappear from Google+, a real blow to educational collaboration when that happens. Teacher Vance and Bobbi Bear led an adventure trek to some desert temples in the 21k area. Anyone can join us. If you need gear we’ll equip you before we set out. We meet in the 24k area and trek north to a river. We’ll have to trailblaze to the right river system. From there we take boats to a village full of husks and villagers who will trade emeralds for rotten flesh and coal. The temples are near there. On this first meeting we embarked on the journey to see what would happen. In a little over an hour we had reached the temples. ANVILL-LTI is web-based software that has three aims: 1) to provide language teachers with a set of speech and lesson creation tools that make it easy to practice and assess spoken language, 2) to build a community of teachers who are willing to share their lessons and ideas around listening and speaking, and 3) to understand (from a CALL developer’s perspective) what kinds of computer-based interactions teachers and students find most beneficial and interesting. We explored these by looking at some of the most popular tasks teachers assign in ANVILL—from telecollaborations to listen n’ repeat, and the results those tasks yield. ANVILL is a free and versatile LMS that focuses on allowing learners to interact in voice with teachers and each other in a tastefully designed flipped learning environment. That environment is succinctly defined in a 10-page manual available here, http://babel-old.uoregon.edu/ylc/downloads/anvill-LTI%20overview-v.3.pdf; with a page each devoted to ANVILL’s main features (voiceboards, portfolios, chat, and integration with other LMS’s such as MOODLE). How to get marks from digital quizzes. Select the option “Enter as a guest” and enter your FULL !!! name into the box. (All attendees are “guests”). 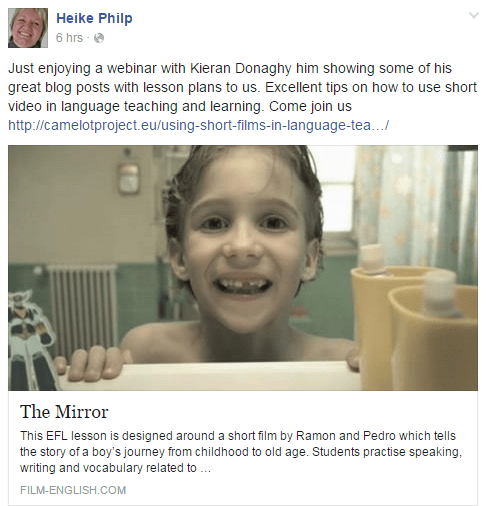 Imelda Elliott is a professor and head of a school of modern languages. She taught English in secondary schools before doing her PhD and becoming a university lecturer. As head of department, she has been involved in setting up a languages for all policy at her university. She has always been interested in teaching and learning. She is involved in language teacher education as the head of a Masters programme on teaching English and as joint head of a Masters Master of Arts in Language Teaching Management, Instructional Design and Technology. If you hold down the control key, you can select several conferences and enroll in one go!!! Henry Rademacher / Host: MoodleFairy Mary Cooch. Sat Oct 17 0900 Pacific Time Classroom 2.0 – Jennifer Garcia –Green Screens + iPads = iMagic! Peggy George, Lorie Moffat and Tammy Moore will be hosting another Classroom 2.0 LIVE show. As an extension to the Classroom 2.0 Ning community, Classroom 2.0 “LIVE” shows are opportunities to gather with other educators in real-time events, complete with audio, chat, desktop sharing and closed captioning. A Google calendar of upcoming shows is available at http://live.classroom20.com/calendar.html. We are very excited to have Jennifer Garcia joining us as our special guest presenter on Saturday, October 17, for her presentation: “Green Screens + iPads = iMagic!” She will be sharing projects her students have done using green screens on the iPads with DoInk’s Green Screen App. We’ll get a guided tour of the entire process including setup, equipment, apps, workflow, assessment strategies and possible issues to be aware of. 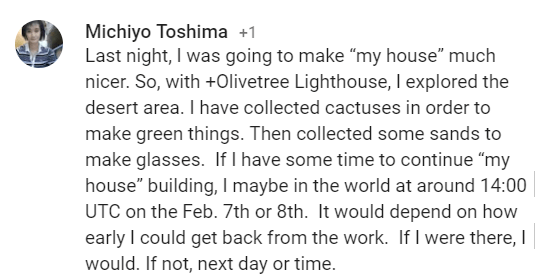 We’ll also get to see a few examples of her student work and have access to the online lessonsshe created to help you as you build your own projects. We’ll also get to see some examples from other teachers along with their resources. This will be most beneficial to teachers who have access to iPads in their classrooms, but it’s always exciting to learn about tools, apps and the possibilities for enhancing digital story telling with any tools you may have access to and we would welcome participants willing to share the tools and project examples for digital storytelling projects you are using in your classrooms. More information and session details are at http://live.classroom20.com. If you’re new to the Classroom 2.0 LIVE! show you might want to spend a few minutes viewing the screencast on the homepage to learn how we use Blackboard Collaborate, and navigate the site. Each show begins at 12pmEastern (GMT-5) and may be accessed in Blackboard Collaborate directly using the following Classroom 2.0 LIVE! link at http://tinyurl.com/cr20live. All webinars are closed captioned. On the Classroom 2.0 LIVE! site (http://live.classroom20.com) you’ll find the recordings and Livebinder from our recent “MineCraftEDU” session with our special guests Laura Briggs, Kim Harrison and Trish Cloud. Click on the Archives and Resources tab. When tweeting about Classroom 2.0 LIVE, be sure to use #liveclass20. Special thanks to our sponsors Weebly, The Learning Revolution and Blackboard Collaborate! 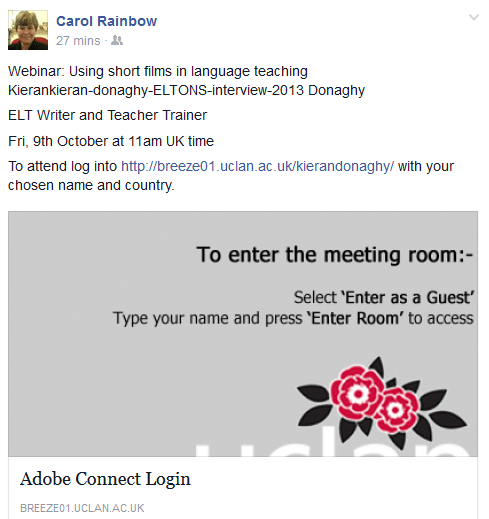 Event description: An overview on how free tools can assist ELT professionals and learners in all everyday professional activities. Practical ideas that can be implemented immediately as well as training sources to deepen the understanding how the tools work. are they before or after? Love forms in Google Drive! …for polls, instant feedback in class, etc. Are MGuhlin and CloudHQ free? Yes Dr Christel, I have had many Teachers say that to me too! I use Google drive sharing documents or folders with my students. Sharing documents as long as they are CC or one has rights to do so. Sharing documents and videos is what I do too! Sometimes it’s easier to share videos in Google drive rather than Youtube which is not accessible to all students. Plus I love creating Lesson slides directly in the drive and adding it to the class materials folder for students to access whenever. It’s such a great tool (Google Classroom) that it’s a dying shame that Google have such strict access to it. Social apps in schools is a bit touchy here in Italy, but using sites like Twiducate is safe and private offering social interaction without the public interaction. I’m looking at EdMettle too for the same, has anyone tried it? OMG – I’ve lost the sound altogether now (on my super duper brand new machine ) so I’m giving up all together – please say a BIG thanks for all the great links …. very useful indeed. I agree…all teachers should have a YouTube channel. I like Google Maps too for a class on ‘directions’ in English language. I get the students to create their own location and give directions in a dialogue. what do you use to leave comments on a non apple computer? Maha, are you asking about Google Docs? What system are you running Maha? Vance is the expert on voice comments…I think there is an addon or extension, right? What slide are we on Vance?? Check out Kaizena Mini addon in Google Docs. Thanks all for a great chat! Off to class! can you hear now Halima? Dr Christel is that Native Speaking tool only available in Classroom? is Exit ticket a written reflection? or a quick journal or something . Nives, have you tried WizIq? To attend log into http://breeze01.uclan.ac.uk/kierandonaghy/ with your chosen name and country. This is an archive of a Classroom 2.0 presentation on MinecraftEDU with Laura Briggs (@LauraBTRT), Kim Harrison (@k4sons) and Trish Cloud (@trishcloud) sharing their experiences and stories about how they are engaging their students with MinecraftEDU both during the school day and in an after school club and summer camp. 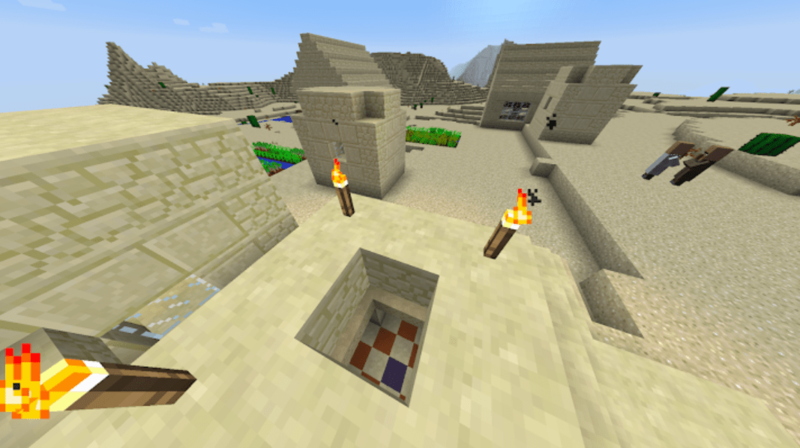 MinecraftEDU is a special version of Minecraft designed specifically for classroom use. It has been used to teach a wide range of subjects and is designed to be open-ended which allows content to be built around any subject area. Teachers have used the game to teach history, math, art, programming, creative writing, science, music, digital citizenship and more! 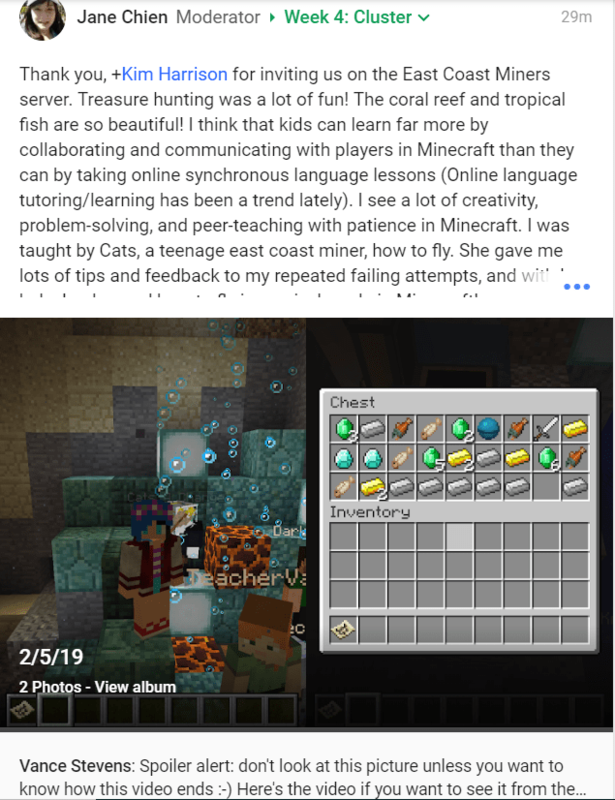 It hosts a library of lessons and activities that are available for free and there is an active teacher community exploring and sharing uses of Minecraft in the classroom. On the Classroom 2.0 LIVE! site (http://live.classroom20.com) you’ll find the recordings and Livebinders on the Archives and Resources tab. Each show begins at 12pm Eastern (GMT-5) and may be accessed in Blackboard Collaborate directly using the following Classroom 2.0 LIVE! link at http://tinyurl.com/cr20live. All webinars are closed captioned. Jamie Keddie is a teacher, trainer and international conference speaker. He is the founder of the recently-relaunched Lessonstream. Jamie’s areas of interest include the use of visual materials, storytelling and video technologies in the classroom. His publications include ‘Images’ (OUP 2009) and ‘Bringing online video into the classroom’ (OUP 2014). In the last few years, online video has been embraced and reinvented by young people. In this webinar, I would like to examine a number of recent case studies which serve to introduce YouTube youth cultures to teachers. Be warned – you may be shocked! I will also talk about why understanding this can be useful to those of us who work with teenagers. 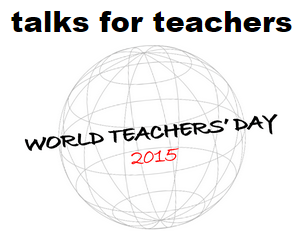 This event is being held to celebrate World Teacher’s Day with a 10 in 10 for 10, a free 10 hour marathon of webinars. Each webinar will be 10 minutes long and utilize 10 slides only. The idea is to get to the heart of the subject. We will open one webinar room lasting 10 hours so there is only one link to enter the webathon. Or Register at http://efltalks.com/ and use the entry you will be taken to immediately on registration. The host or hosts will have a 2 minute window to thank the presenter, mention the speaker’s site or email and then introduce the next speaker. This will allow for 5 speakers per hour so we hope to have 50 speakers during the course of the marathon. All presentations were recorded and are now posted on http://www.efltalks.com/Videos.html (organized and set up like the TED talks page). This is a free and non-profit event. Helping new and future teachers is our goal, and we also want to have fun. Sun Sep 27 LEARNING2GETHER, the Interview with Rob Howard on EFL Talks 10 in 10 for 10 – What, why, and how can you participate? Current educational research tells us that one of the most effective things we can do to help our students learn better is to tighten up the feedback cycle, giving them faster and more timely comment and critique on their work. This session will provide you with ideas techniques and tools for improving student progress by providing better and more effective feedback with+Google Drive. Location: Blackboard Collaborate (http://tinyurl.com/cr20live)Peggy George, Lorie Moffat and Tammy Moore will be hosting another Classroom 2.0 LIVE show. As an extension to the Classroom 2.0 Ning community, Classroom 2.0 “LIVE” shows are opportunities to gather with other educators in real-time events, complete with audio, chat, desktop sharing and closed captioning. A Google calendar of upcoming shows is available at http://live.classroom20.com/calendar.html.We are very excited to be able to feature Stephanie Suter. Stephanie is an experienced and inspired Edu.Buncee Ambassador who is a fantastic elementary teacher in Southold Elementary School, New York. Edu.Buncee is a web-based creation and presentation tool that is really simple to use and enables you to easily bring together all kinds of content (Buncee artwork, photos, videos, drawings, audio, and links) onto one digital canvas, making a cloud-based, shareable creation. Student’s can use Buncee to turn their experiences and lessons into multimedia digital stories, travel scrapbooks, research projects, and more. Teachers can create interactive lessons and multimedia presentations, flip their classrooms, and send home beautiful newsletters and invitations to parents and the local community. Stephanie will describe Edu.Buncee and provide us with examples and stories about how she uses it in her classroom.More information and session details are at http://live.classroom20.com. If you’re new to the Classroom 2.0 LIVE! show you might want to spend a few minutes viewing the screencast on the homepage to learn how we use Blackboard Collaborate, and navigate the site. Each show begins at 12pmEastern (GMT-5) and may be accessed in Blackboard Collaborate directly using the following Classroom 2.0 LIVE! link at http://tinyurl.com/cr20live. 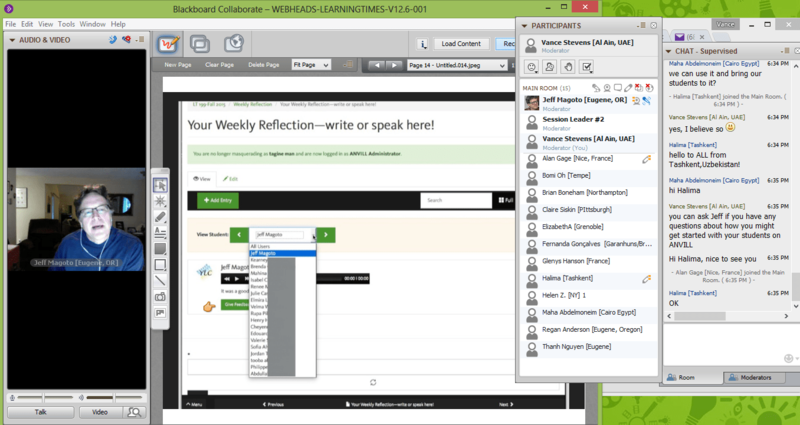 All webinars are closed captioned.On the Classroom 2.0 LIVE! site (http://live.classroom20.com) you’ll find the recordings and Livebinder from our recent “eCyberMission” session with our special guest Matt Hartman. Click on the Archives and Resourcestab. 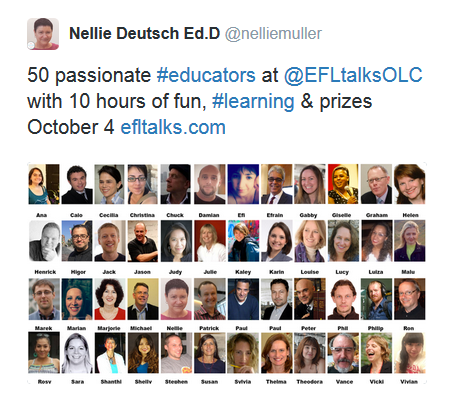 Learning2gether with Rob Howard on EFL Talks 10 in 10 for 10 – What, why, and how can you participate? EFLtalks is a non-profit mission to produce an open and free space to share advice, tips and ideas to the next generation of EFL professionals. The project mixes the ideas of a webathon with a Pecha Kucha and TED talks all into one. Real blended teaching. 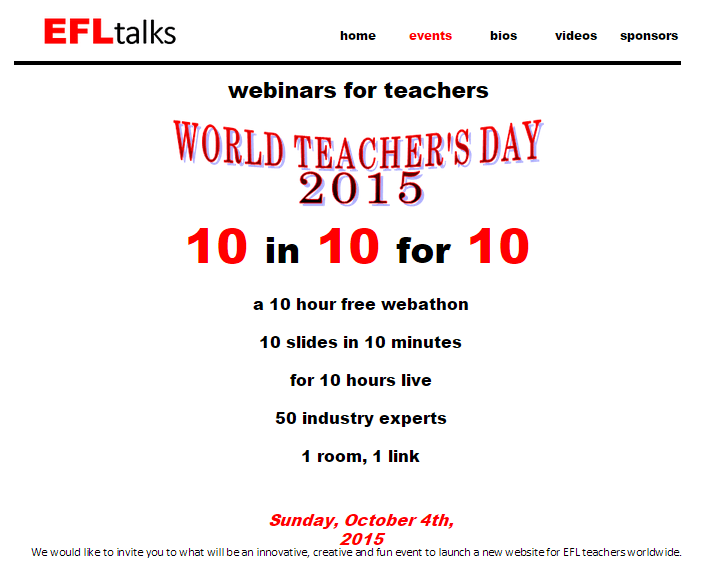 For the event, celebrating World Teachers’ Day, Rob and his team will kick-off a free 10-hour marathon of mini-webinars. Each speaker will have only 10 minutes using only PowerPoint 10 slides to make their point about their subject. We will open one webinar room lasting all 10 hours so there is only one link to enter the webathon, and viewers may come and go as time permits. Chatwing as a Pre-hang out is Great!!!! So happy to see the link and the opportunity to see so many presentations. I need to be at Free Geek @ 10:10 (lol) Minnesota time so will watch more later. Thanks for always reminding me of these hangouts. Monday night, September 21st, at 7:30pm EDT Richard Byrnewill be presenting a free one-hour Webinar on strategies for using blogs, social media, and email to promote the resources that you can sell through the TES Marketplace. Register to attend live, or to receive a link to watch the recording, HERE. This event is sponsored by TES. The TES Marketplace is open to any educator who wants to offers free and or premium resources to other educators. Educators who sell their resources through the TES Marketplace receive 100% for resources purchased in the U.S. There’s no limit to how much you can earn. In the Webinar Richard will share his best strategies for promoting the materials without feeling like you’re turning yourself into a sales person. A TES representative will also be on the webinar show the unique features of the TES Marketplace. Says you have to register to receive the Hangout link; what if you just want to watch the stream? Welcome to the European Day of Languages 2015 we will celebrate on 24th September 2015. Because the 26th September is a Saturday and our school is closed that day we want to celebrate that event on the 24th September already. This event is set up every year by the European Council in Brussels for all kind of schools in Europe to raise awareness about one common Europe community on one hand and to express the lingual diversity of all members of the EU on the other hand: “Being convinced that linguistic diversity is a tool for achieving greater intercultural understanding and a key element in the rich cultural heritage of our continent, the Council of Europe promotes pluralingualism in the whole of Europe.” Fourty-seven member countries belong to this community including the islands outside the European continent which belong to the EC as well. 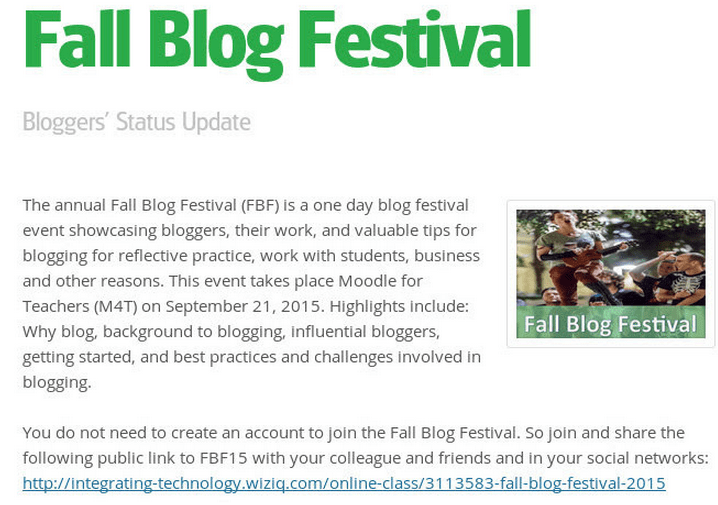 On Monday September 21 Learning2gether joined forces with the Fall Blog Festival organized by Nellie Deutsch. 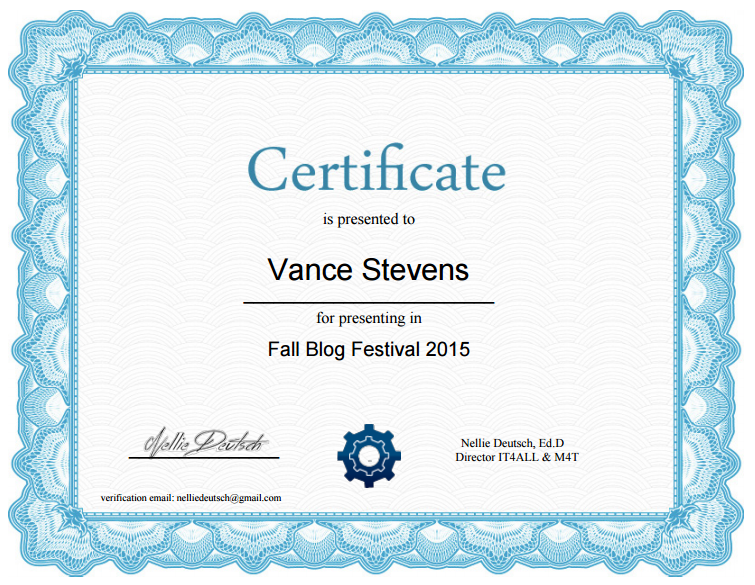 The annual Fall Blog Festival #fallblogfest is a one day blog festival event showcasing bloggers, their work, and valuable tips for blogging for reflective practice, work with students, business and other reasons. Highlights include: Why blog, background to blogging, influential bloggers, getting started, and best practices and challenges involved in blogging. Certificates of Participation will be available to those who attend 60% of the webinars and write a blog post about the event. 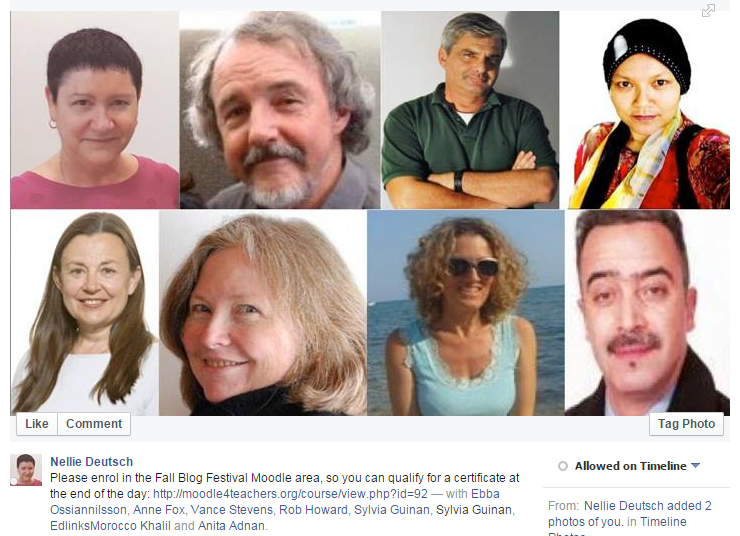 Submission of the links to the blog posts and attendance area are on Moodle for Teachers website. Click to http://moodle4teachers.org/course/view.php?id=92 to enrol in the webathon for 2015, though no need to sign up for the class with your name unless you want the certificate. Some of the conversation below has to do with the fact that Nellie set up the link to the event on the assumption that anyone could easily join without pre-registration, but when we tried to get in, the system would drop us from the event (because another unregistered person was already using that link). Some of us worked out that the way in was to register through our WizIQ accounts (in my case, in the nick of time for my session!). The chat shows where Nellie and others were dealing with the problem and helping to get people in. Susan: Aloha Everyone! Not sure how long I can be here. Bad internet and on a chromebook. Sound not very clear but slides are GREAT. Peggy: time zones can be so confusing! I rely on timeanddate.com to help me! Tiziana: Hi NIVES! HI PEGGY!! Peggy: Hi Tiziana! Great to see you! Tiziana: Hi ! PLESED to be on line and learn from so many communities on line which are really engaging!! Peggy: I don’t know how Vance keeps up with so many networks but he is amazing!!!! Tom: Nives, do not leave the session. It’s a continuous class, all day long. Brian B: Its taken along time to get here so I will not be leaving yet. Nives: Dr Nellie – what will happen with people following the Twitter or FB links which are not working ? 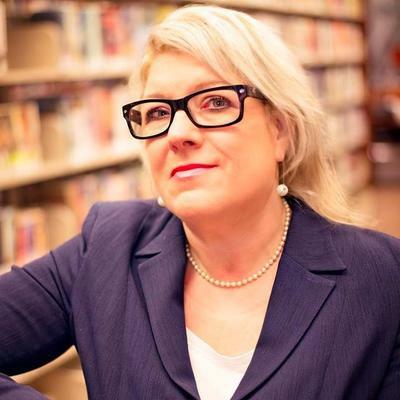 Nives: I agree Peggy – chatting during an event in a backchannel keeps (me) motivated and engaged. Nives: Register … I did that and it did not work…! Peggy: Thank you Vance for all you do to bring these amazing professional learning experiences to all of us through Learning2gether!!!!! Peggy: you can’t get the link with your name unless you register. That’s how I finally got it. Nives: Will the recording also have the same problem Dr Nellie when trying to access it ? Rob Howard: I hope we learn! Nives: I think we always learn as long as we experience something, no? Peggy: will the recordings for these sessions be separate recordings for each session or one long recording? Peggy: sorry Nellie. Not prepared to take the microphone today. Peggy: what is the url for your youtube channel? Nives: Oh good idea YouTube one for each Dr Nellie – I will rely on those recordings. Peggy: Thank you Vance for this great presentation! Sylvia Guinan, A teacher for all seasons, The relevance of journalling: mission, values & the bigger picture of your teaching life. GEC members are welcome to participate in Global Collaboration Day onSeptember 17, 2015. Companies, non-profits, and schools will be coming together in a global demonstration of global collaboration. There are activities available for individuals and for classrooms. If you browse our separate site for Global Collaboration Day, you’ll find something for everyone! To get started, we recommend that you take a look at our overview page. We also have new videos that will help you understand this event. Activities are posted in our calendars and event directory. More will be posted soon. It is NOT too late to host a simple collaboration online for participants. Check out our host page for details. We are sending out updates via text and email using the free Remind app. Sign up here. A few GlobalEdCon (our November online conference) keynotes will be announced on Thursday! Stay tuned! Looking forward to September 17th! Hope you all can join us! 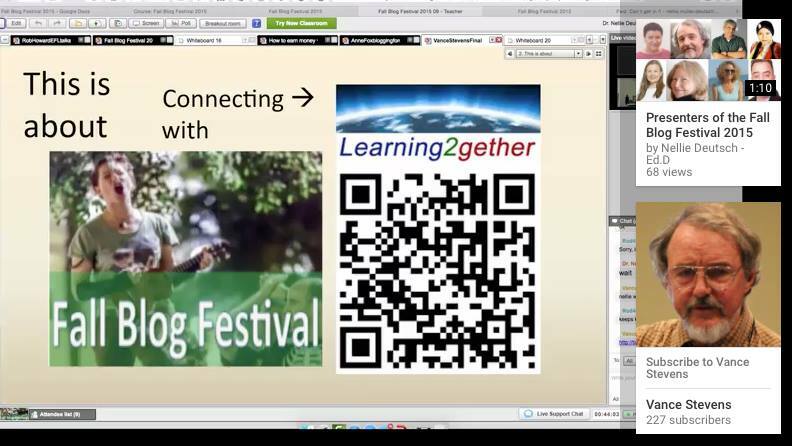 Conversation about Learning2gether starts at 27 minutes into the audio, minute 38, 43 etc. The LASIG, Learner Autonomy Special Interest Group of the IATEFL, would like to invite you to take part in its first webinar on Saturday 19th September 2015 at 3pm BST / 2pm UTC /4pm CEST. In this webinar Anna Uhl Chamot is going to explain How language learning strategies can foster Learner Autonomy. The webinar is free both for members and non-members of LASIG.